Here on the pages of Dark Roasted Blend we already explored some intriguing mysteries and mind-boggling visuals of microworld, marveled at recreating nature in glass and shuddered at some apocalyptic scientific experiments. 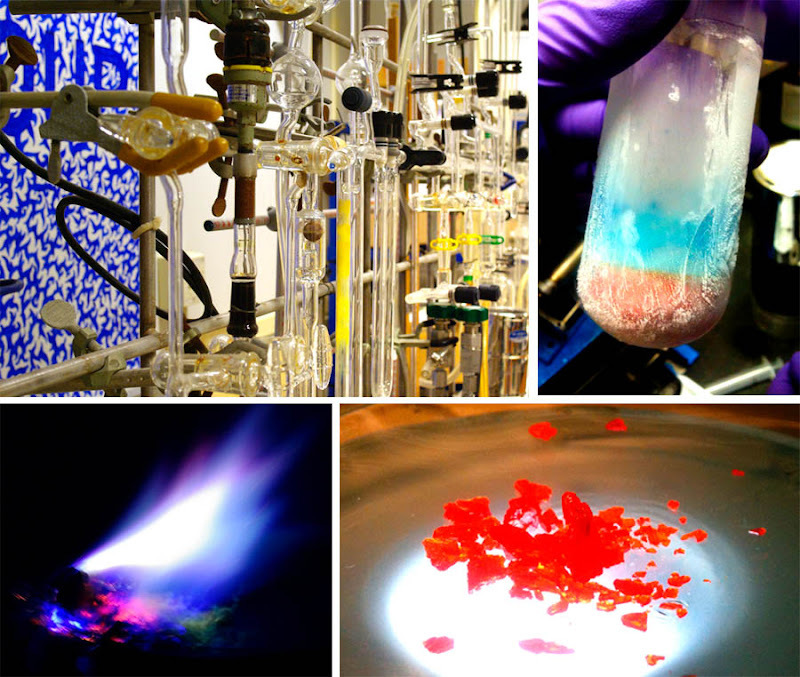 Today, we present to you the colorful, spellbinding world of chemistry - full-color wall-size poster and safety instructions attached (just kidding). Alex Carpenter is a chemist at UCSD and the manager of The Chemography Project. He wrties to us: "We are a non-profit site that exists to post an awesome chemistry related photographs daily and hopefully teach people a little about chemistry. 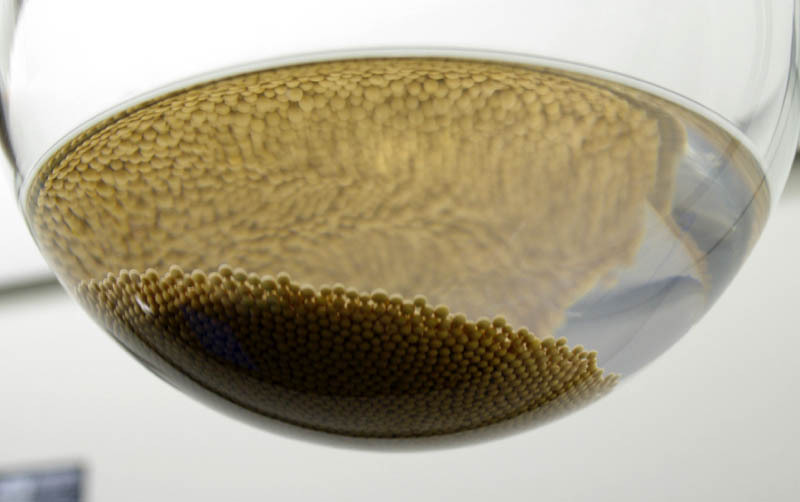 Chemography exists to provide a daily glimpse of science at the point where it intersects art. In doing so, we hope to educate through a visual exploration. We are excited to present on Dark Roasted Blend some of the highlights of this exploration"
A kilo of magnesium burns at over 3,000 degrees Celcius. 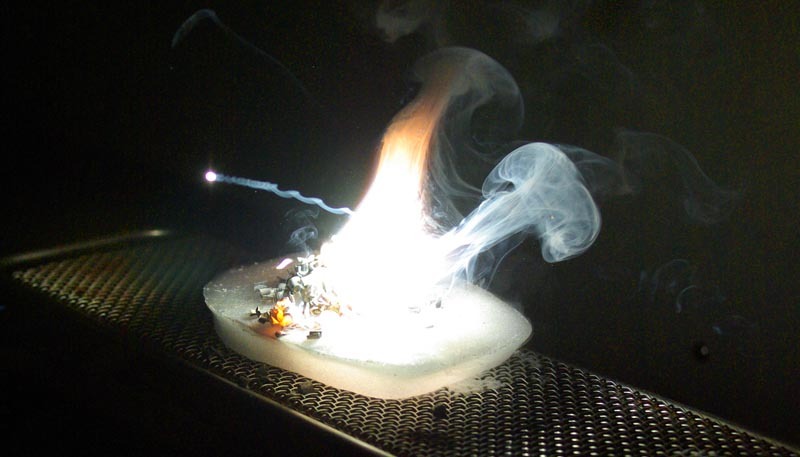 Hot enough to melt through most materials, the magnesium rests on block of dry ice so that it doesn't melt through the stand which supports it. Like any molten metal, mercury can be poured into molds, cooled and even worked. Here it has been solidified into the shape of a hexagon. 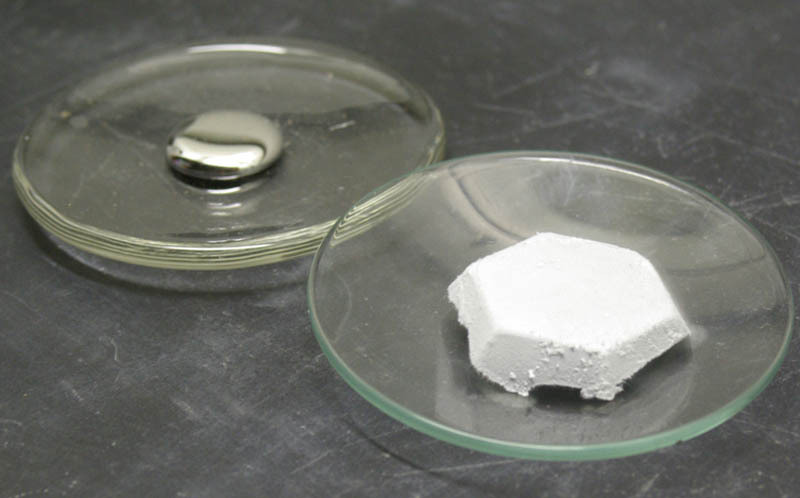 Once solidified, mercury is little different from lead or tin. Indeed, on a colder world mercury might just be used to make balls for firearms or figurines for children. 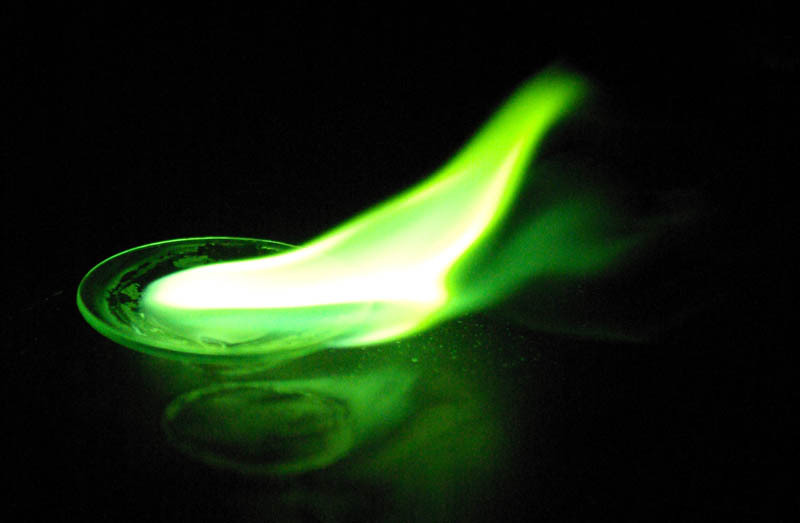 Fitting of The Green Lantern, trimethyl borate, a clear colorless liquid, produces an intense green flame when burned. Aside from its aesthetic beauty, trimethyl borate is an extremely important chemical feedstock for the production of boronic acids used in well-known palladium coupling. Is this some sort of a reactor core of a ship in Star Wars? 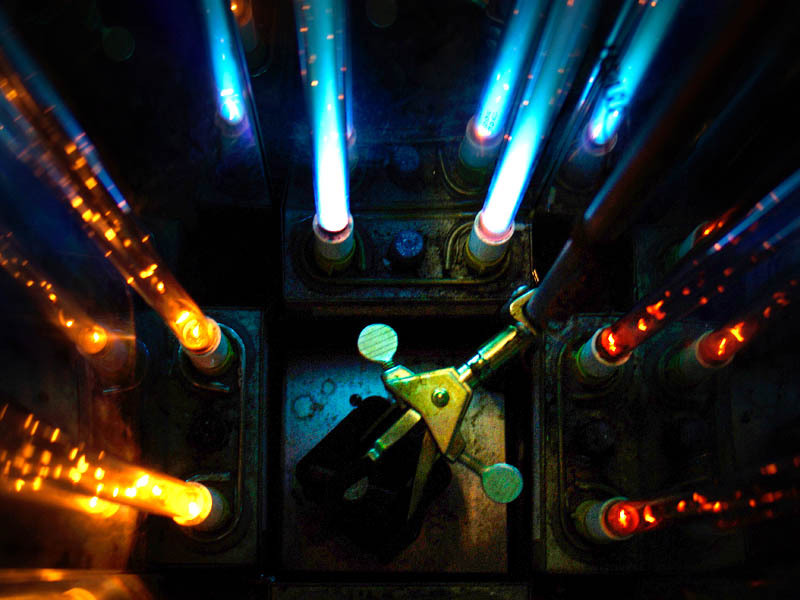 Interestingly, this photograph shows the inside of a mercury vapor photolysis reactor. 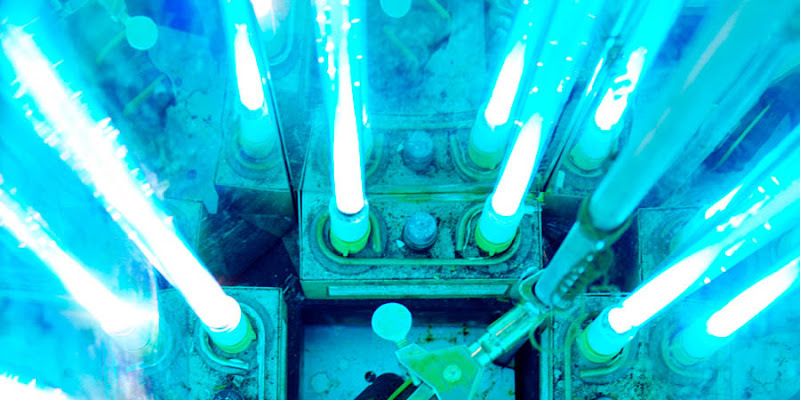 Taken at the moment the reactor was powered down, the flickers of light are bits of mercury plasma cooling back to clear, colorless mercury vapor. Ever wonder how ceramics are made? 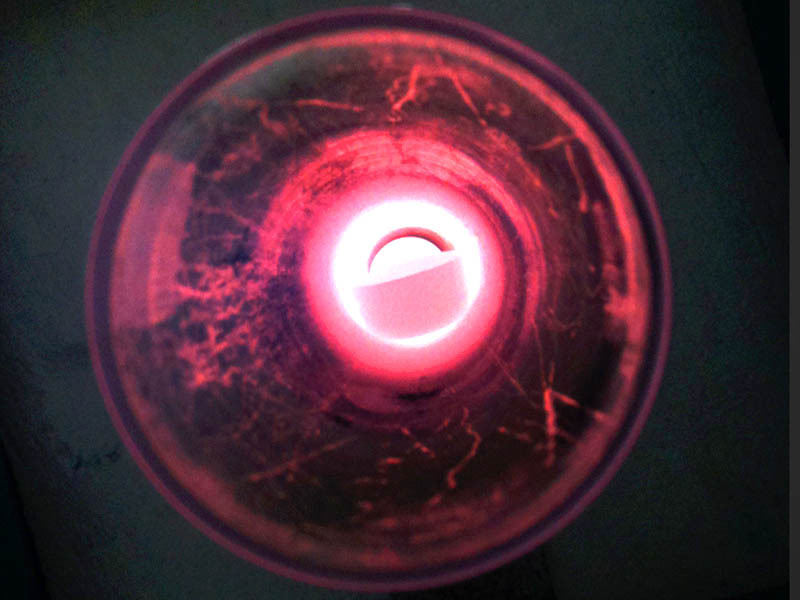 In this image, a tube-furnace heated to a 900 degrees Celsius is being utilized to sinter a 1-2-3 superconductor into a ceramic pellet. Ancient depictions of hell often talk about fire and burning brimstone (sulfur). 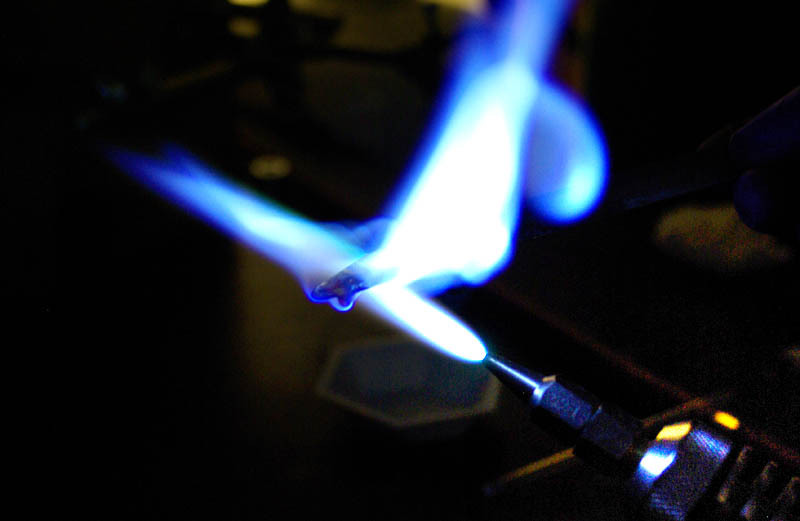 When heated, yellow-colored sulfur melts into a blood-red liquid that can be ignited to yield an intense blue flame. Maybe depictions of burning hell should be blue instead of red. The heart of a titanium-sapphire laser is, you guessed it, a highly-polished synthetic sapphire crystal doped with titanium. 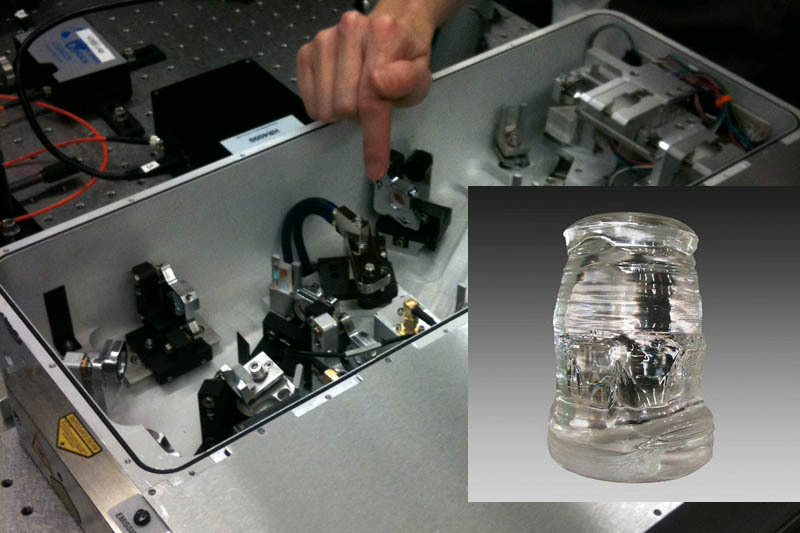 This particular laser is used in optical trapping experiments to capture and suspend particles. Ever wonder how they get different colors in fireworks? Different elements produce different colors when burned. For example: sodium (yellow), potassium (purple), lithium (red), copper (blue) and barium (green). 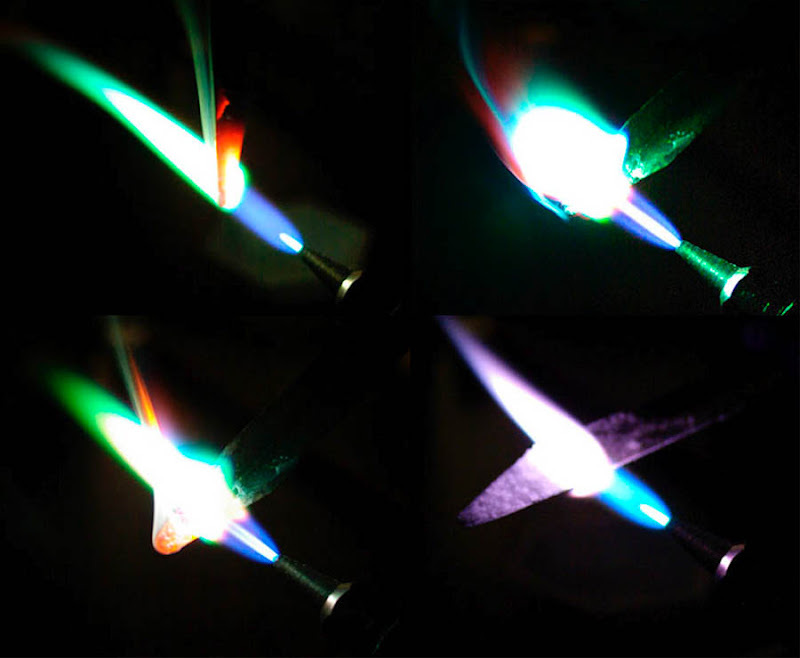 In this series of images, we have mixed a variety of salts and heated them using a propane-oxygen torch to produce a variety of colors. Often the first question asked when people walk through a synthetic chemistry lab, the beads are molecular sieves. Essentially a “fancy clay”, molecular sieves are zeolite mineral composed of aluminum and silicon. 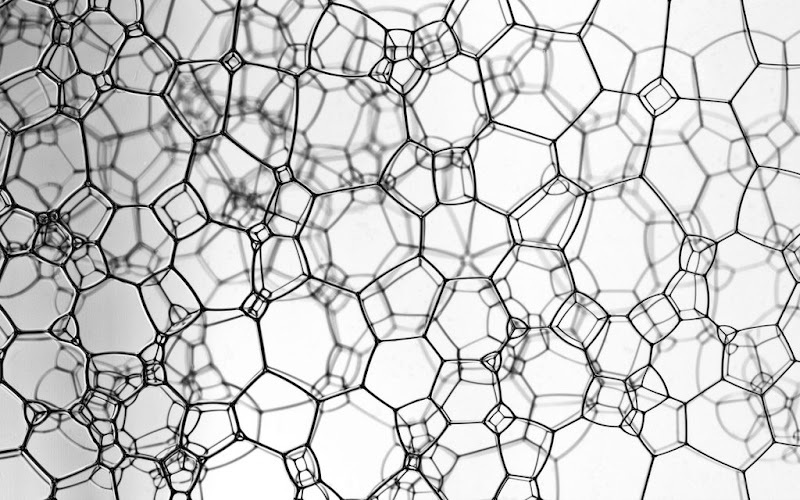 As their name suggests, sieves capture molecules (like water or oxygen) using small pores of uniform size. A lot like "goldilocks", these pores are just the right size to remove water but not organic compounds of interest. The rich purple color of iodine vapor is unmistakable. Although iodine is a solid at room temperature, it is easily vaporized under gentle heat to produce a beautiful purple gas. Take aqua fortis (HNO3) and mix with muriatic acid (HCl) in a one to three ratio. Wait a few minutes and you have an orange, bubbling tonic known as aqua regia or royal water. 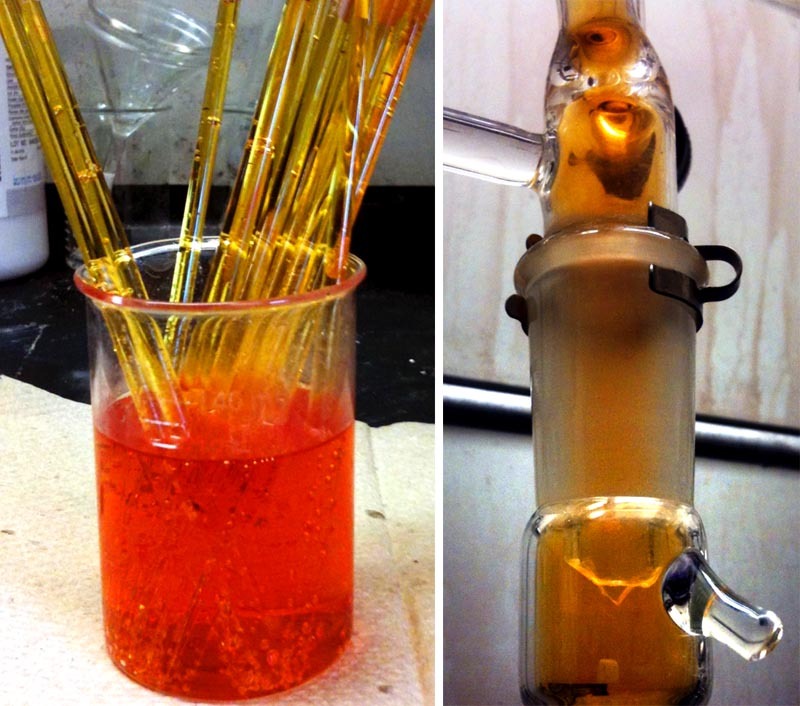 When first prepared aqua regia is colorless. 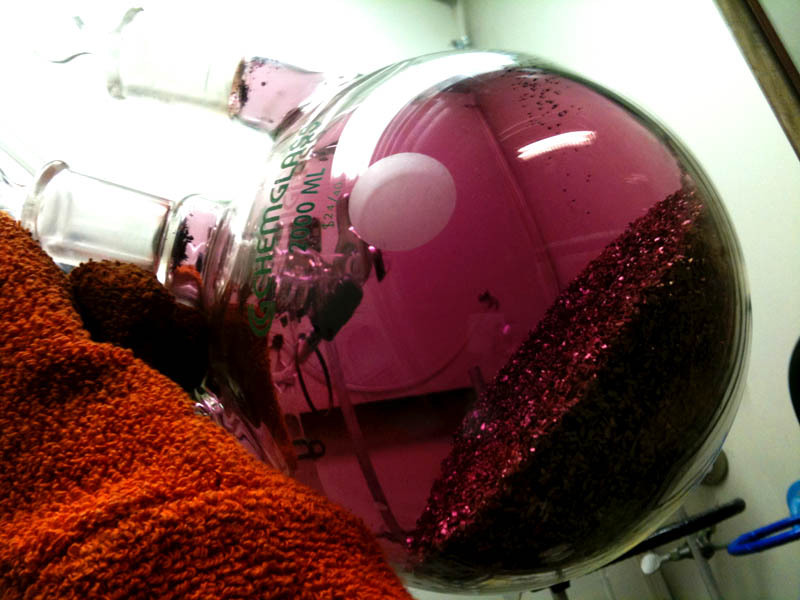 Over minutes, the tonic partially decomposes: generating the powerful, red-colored oxidizerdinitrogen tetroxide. As a notable aside, N2O4 is popular component in rocket fuels. Able to dissolve the so-called “noble metals” like gold, silver, and platinum, this acidic mixture has played a storied role in human history. Alchemists used it to "transmute" gold. De Hevesy used it to hide gold from the Naziʼs. And less glamorously, modern organometallic chemists use it daily to remove metals from glassware; while artists use its potent properties to etch metals. Right image above shows nitrogen dioxide: anyone living in a big city knows the brown haze that can accumulate. That haze is nitrogen dioxide (NO2). Aside from turning city skies brown, NO2 is one of the most potent greenhouse gases. A major accomplishment of the EPA and emission controls in the 1970ʼs was the introduction of catalytic converters which considerably reduce NO2 emissions. 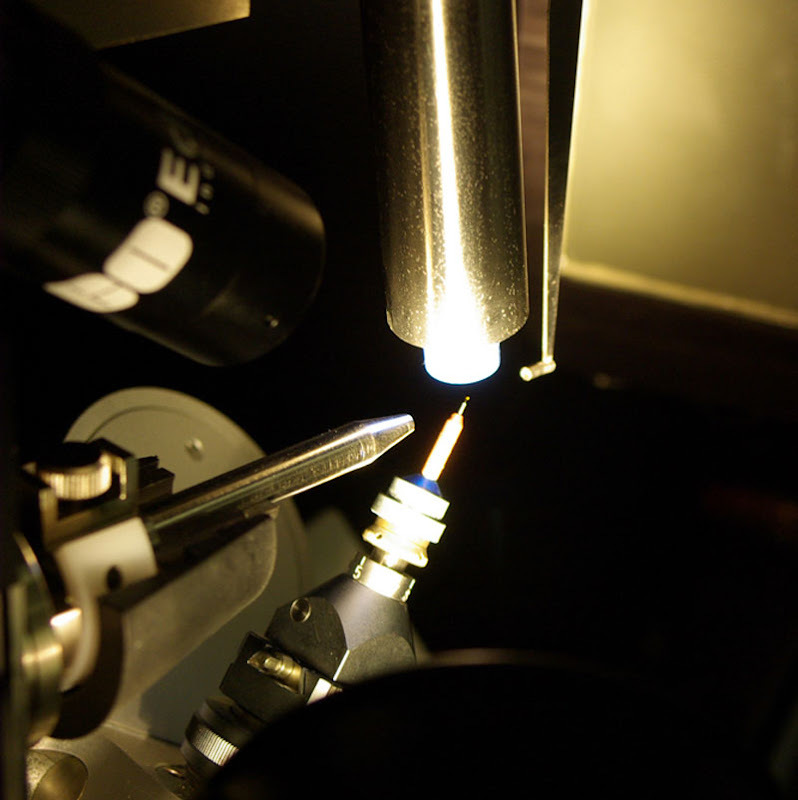 Although there are a variety of techniques to identify molecules, the closest a chemist can get to taking a picture of a molecule is x-ray crystallography. Passing ultra-high energy X-rays (enough to necrotize flesh with only seconds of exposure) through a crystal of any compound yields a diffraction pattern. Solving this diffraction pattern, in turn, provides a three-dimensional picture of the molecule of interest. In the image, the X-ray beam passes from the beam-collimator at bottom left, through a single-crystal (~ 1 mm3 ) and onto a $120,000 CCD detector which captures the diffraction pattern.